Claritin Hayfever Relief Online - $20 US* for 30 Tabs - FREE DELIVERY - no prescription required - Buy Claritin Online from PharmacyDiscounter.com. 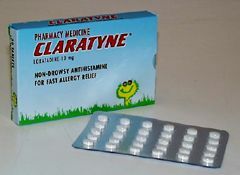 Identical to Claratin, Claratyne - Antihistamine/Antihistamines/Antihistimines. Claritin Hayfever Relief Online - No prescription needed - buy online at low prices from PharmacyDiscounter.com. Claritin (hayfever relief) also known as Claratyne is a medicine that belongs to a class of medicines known as antihistamines. Claritin is a non-sedating anti-histamine that only needs to be taken once a day for Hayfever Relief. Claritin helps reduce allergic hayfever symptoms by preventing the effects of histamine, which is produced by the body, providing hayfever relief. Claritin antihistamine hayfever relief relieves symptoms associated with allergic rhinitis, (hay fever) such as sneezing, runny or itchy nose, and burning, watery or itchy eyes. It is also used for the relief of symptoms and signs of chronic urticaria, (hives) and other allergic skin disorders. It is not considered addictive. Each tablet of Claritin Hayfever Relief (Claratyne) contains Loratadine 10mg - the active ingredient. Other ingredients in Claritin Hayfever Relief (Claratyne) are maize starch, magnesium stearate and lactose. Order Claritin Hayfever Relief (Claratyne) here. Orders are dispatched within 24 hours, and sent by FREE fast worldwide delivery. Do not use Claritin (Claratyne) if you are allergic to it or any of the ingredients listed above, or if you are pregnant or breastfeeding. It is not suitable for children less than 2 years old, or if you have liver disease or eye problems (such as high pressure in the eye or glaucoma), sugar diabetes, prostate enlargement, or problems with your liver, kidney or bladder. While you are using Claritin (Claratyne) you should inform all Doctors, Dentists or Pharmacists who are treating you, and inform them if you become pregnant whilst using Claritin (Claratyne). It is unlikely to make you drowsy, however you should not drive or use machinery the first time you use it. You should stop using it 48 hours before you have any skin tests. Purchase Claritin (Claratyne) here. Orders are dispatched within 24 hours, and sent by FREE fast worldwide delivery.